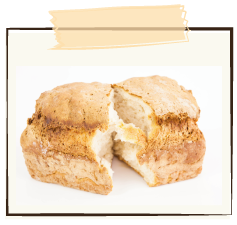 Our basic bread loaf, made from a blend of soy flour, rice flour, potato and tapioca starches. Wheat free, gluten free, dairy free, egg free, nut free and yeast free. Rice flour, potato starch, soy flour, tapioca starch, soy lecithin, canola oil, glucono delta-lactone (575), xanthan gum (415), guar gum (412), salt, water added.